It’s important to know what you are looking for when scanning a building for foundation problems. There are differences between foundation problems and normal settling, although at times they may present themselves similarly. A wise homeowner once said, “Scanning your property for signs of foundation problems is the best thing you can do to prevent HUGE problems down the road.” It’s true; your home’s foundation is everything to its overall structural integrity. Even the smallest foundation issues can bloom into massive structural instabilities without timely repairs. Are Newer Homes At Risk For Foundation Problems? YES! Your home doesn’t have to be old to experience severe foundation problems. In fact, homes as new as 5-years-old often display some of the worst damage of all. Say for instance a home is built during a particularly rainy season when the soil is very wet and expanded to full capacity. Over the next several years the home will experience normal shifting and settlement. But let’s say in its fourth year of existence a serious drought dries out the soil so that it retracts to its minimum capacity. As a result, the home could potentially sink 5-inches in only a few months. Settling is normal and expected to occur but foundation problems are much more serious. Visible cracks in your foundation may signal nothing more than routine settling, but then again cracks could also signal the start of serious foundation issues. If your foundation is experiencing issues you will notice other signs aside from just cracks in the foundation. Settling will not include these additional signs, so they serve as a big indicator that it’s time to call out a professional. 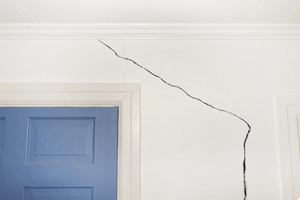 Cracks that run up the walls: If you notice jagged cracks creeping up the walls at a forty-five degree angle it’s a pretty serious sign that your home’s foundation is shifting in such a way that the sheetrock is tearing apart. Annoying issues with doors and windows: As your foundation shifts out of place there will be noticeable issues with doors and windows. They may stick and be difficult to open for no apparent reason at all. This happens because when your foundation shifts considerably the frames around windows and doors actually push out of place. Once out of balance they can’t open the same way they were intended to. Look Up Towards The Ceiling & High Up On Walls: Foundation problems originate beneath your home but they often make themselves apparent on the uppermost regions of a building. In fact, most signs tend to appear near the top of the house as opposed to along the bottom. A very common sign to look out for are cracks above window frames. You may need a ladder to see the uppermost areas of your home. If your home is made out of brick be on the lookout for stair-stepping cracks apparent in the veneer of the brick. Cracks In Foundation: Often the first place damage originates is through cracks in the actual foundation. Different types of cracks will signal different types of damage. For instance, if cracks are horizontal it is a sign of too much water pressure against the foundation. If caught early enough small repairs can be made and water can be redirected elsewhere through drainage methods. If you notice small cracks in the foundation it may or may not signal anything major. The best thing to do is to mark cracks and take photos to document the extent of the crack. You may even want to measure cracks and take note of exact size. Check back frequently to see if the crack is getting any larger in size. 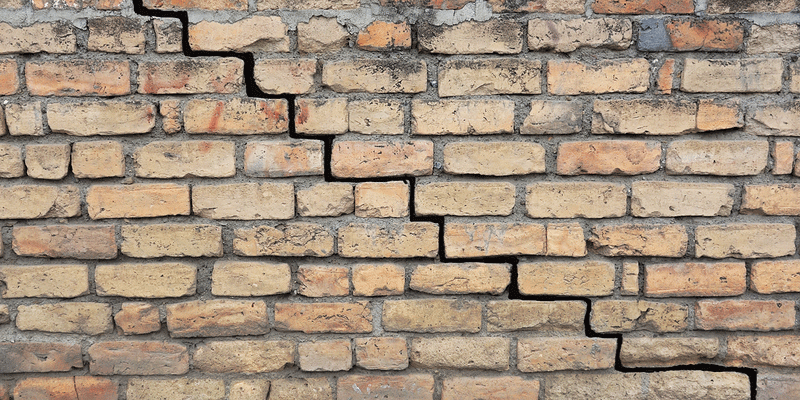 If the crack does show signs of growth there’s a good chance your foundation requires repairs. Help! My Home Has Foundation Issues. Now What? If it turns out that your foundation is damaged there are a number of potential repairs that can be done. Depending on the extent of the damage and solutions available, the overall cost to implement repairs will vary. Never wait to call out a professional. At the first sign of damage it’s best to get an expert opinion. Once a faulty foundation is ignored for too long it becomes broken beyond repair, requiring a complete teardown and rebuild. Turnbull Masonry has extensive experience repairing faulty foundations on new and historic properties. Let us find the most cost effective solution to give you the peace of mind that comes with a stable home on a solid foundation.